The Penn immersion Program is for students of Zulu across the nation to participate in an intensive, immersive intermediate-advanced program in Zululand, KwaZulu-Natal, South Africa. The project is approved by the U.S. Department of Education for foreign languages and area studies (FLAS) fellowship. Any other funding sources are also accepted. Availability of awards is contingent upon federal funding. 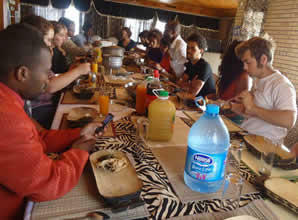 The Zulu Immersion Programoffers students an opportunity to advance their language and cultural competency in the Zulu language through interaction with faculty, staff, students and families in KwaZulu-Natal, South Africa.The eight-week program combines intensive classroom instruction with home stays (urban and rural settings), lecture seminars, outreach cultural activities, and visits to historical and cultural sites. Students spend time in the city of Durban and in Zululand at eMpangeni and Richards Bay. They experience total immersion in the language and culture of amaZulu (Zulu people) by living with host families at eMpangeni and in a rural village at KwaDlangezwa for the entire duration of the program. 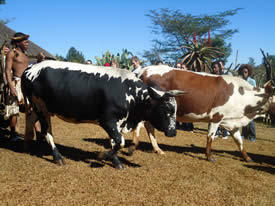 The University of Zululand (also known as Ongoye), located in Zululand at KwaDlangezwa near eMpangeni (about 90 miles north of Durban), is the host institution for the Zulu Immersion Program. Situated in the home of amaZulu (Zulu people) right in the community of Zulu speakers, within proximity to major Zulu historical and cultural sites, the University of Zululand renders the opportunity for total immersion in the language and culture of amaZulu. On campus participants can interact with university staff, faculty, and students. They have access to amakhosi (chiefs) and izinduna (local community counselors) and other local community experts, some of whom work for the university and also serve as host families. The University of Pennsylvania is the administrative institution for the program.